Stylish and elegant, with the warmth of country comfort; this spacious and tastefully furnished home is nestled amongst the rolling hills of Foster North. The positioning of this stunning home enables it to capture breathtaking views of Wilsons Promontory, the nearby beaches of Sandy Point and Waratah Bay and the local inlets from almost every angle. 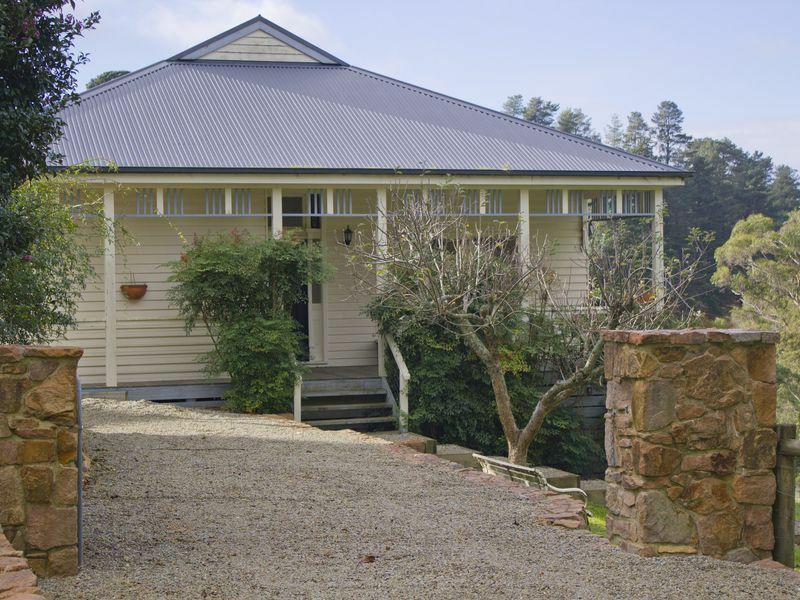 Set on 37 acres of bushland and rolling (productive) pasture, the 2 acres surrounding the house is positioned amongst beautiful stone walls embracing the lush gardens, whilst the play equipment (swings, monkey bars and trampoline) at the rear of the house provides entertainment and pleasure for those with energy to burn. The outdoor Weber BBQ and comfortable seating on the west side of the house, encourages you to relax and enjoy the surrounding beauty as the sun sets on the picturesque surrounds. You may be lucky enough to spot some of the local inhabitants - deer that roam wild in the paddocks, wombats, echidnas, koalas in the gum trees on the hillside, parrots and cockatoos. It is for this reason that we ask all guests to adhere to our strict no pet policy. The entry of the home welcomes you into the large, open-plan kitchen and dining area. Comfortably accommodating 10 guests, the open fire place is a welcome comfort throughout winter whilst the functional kitchen enables food preparation and cooking with ease. The enticement of a hot coffee from the coffee machine provided or glass of vino’ whilst you soak up the views and settle into the couch is further enhanced upon entering the lounge room where you are greeted with another glorious fireplace, high ceilings and expansive, panoramic windows. With a large selection of reading material to accommodate all ages and interests, along with DVD player, board games and BOSE Audio, guests are bound to find their peaceful place. The spacious main bedroom features a king size bed, in-built robes, reading corner and sun-lit ensuite. The second bedroom utilises the space and offers 6 single beds for guests - including bunks and stand alone singles. The third bedroom offers beautiful garden views with a lovely queen bed and bedside tables to compliment. The sizeable bath in the main bathroom is a welcome relief to anyone who may have spent the day exploring the nearby attractions - riding the extensive Rail Trail, swimming or meandering along the scenic beaches of Sandy Point, Waratah Bay and Walkerville, exploring Wilsons Promontory National Park, Tara Bulga National Park or Agnes Falls Waterfall. Laundry facilities are provided, including a washing machine and dryer for guests to use. All linen is included, with bath towels also provided. Guests are requested to bring their own beach towels should they be required. The seclusion of this property along with extensive provisions inside and out, enables guests to arrive and settle in, and just relax. With nearby towns offering quality coffee, cafes, wineries, olive groves, galleries, arts, parks, crafts and produce, you are bound to find something for everyone, whilst enjoying the peace, tranquility and spectacular views of this unique abode. Personal transport is a must, as there is no public transport nearby. Local townships of Fish Creek & Foster are approximately 10 minutes away, Wilsons Promontory National park 45 minutes, local beaches of Sandy Point, Waratah Bay and Walkerville are approximately 30 minutes drive. Minimum night stay 2 nights, unless on public holidays which is a minimum of 3 nights stay. A perfect place for friends and families to stay and enjoy. 1/ Guests are welcome to enjoy the gardens within the house yard, however access to the paddocks/ pasture is not permitted. 2/ We have an extended check-out time of 11am. Any late departures without host’s approval may incur an additional night’s accommodation charge. 4/ This is a NO SMOKING house - outside only. Stunning views, well appointed, very relaxing. The house was beautiful and you're smack bang in the middle of nature. We really enjoyed our stay, and even though there's no wi-fi, you won't get bored and it's the perfect opportunity to unwind. We also used some of the herbs in the garden for our dinner! Prom views country home is a beautiful property, the view is breathtaking. The house is spacious, clean and comfortable, and the kitchen has everything you could need. We had a wonderful time and would recommend staying here to anyone. Absolutely gorgeous country place with spectacular views and the most comfortable bed I have ever slept on. This holiday house has everything it could possibly need for a getaway. It felt like a very beautiful nurturing home to be in and Sam the host was exceptional to deal with along the way. Thank you for a beautiful stay. I highly recommend. The house was well presented and clean. The place was as pictured in the listing. The host was easy to deal with and was very hospitable. Thank you for opening your lovely home to us.